30 Second Wine Advisor: Grape varieties touch in your glass? Grape varieties touch in your glass? The other day I was enjoying a leftovers lunch, a mix of doggie-bag leftovers from restaurants and sundry stuff in plastic tubs in the fridge. A dish of Palestinian babaganoush caught my eye, and so did some cottage cheese. I took a little of each, and suddenly a light bulb went off over my head. How would they taste together? I picked up a little of each in a single forkload. Pretty good! The earthy eggplant, tahini and garlic in the babaganoush mellowed nicely against the dairy tang of the cottage cheese. I smiled. Then I noticed that my wife was looking on with mixed horror and disgust. Some people love to mix their foods. Others won't let anything touch on the plate. Each to his or her own, and the world spins on. It occurred to me later, though, that this grand division of all humanity might stand as metaphor for those who insist on single-varietal wines and those who love blended grape varieties. Depending on circumstances, I can go either way: Red Burgundy is 100 percent Pinot Noir, and I wouldn't have it any other way. Pinot is a prima donna, a star who needs to take the stage alone. But 100 percent Cabernet Sauvignon? Not so much. Give me a delicious Bordeaux blend of Cabernet mellowed with Merlot and maybe a bit of Cabernet Franc and other players. Ditto for Tuscan reds, where I'll wash down my pasta and "gravy" with 100 percent Sangiovese but would really rather have a classic Chianti blend of Sangiovese with Canaiolo, a splash of Malvasia and more. Those who won't let foods touch on their plate or grape varieties blend in their wine glass argue that mixing varietals yields a "muddy" mutt of a wine without clear definition and personality. I lift my glass of 13-variety Chateauneuf-du-Pape in their general direction and retort, "Taste this." 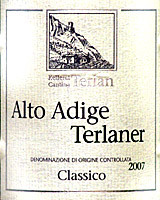 Today's featured wine, Terlan 2007 Alto Adige Classico Terlaner from the Northern Italian Alps, might be another good demonstration. A tasty blend of 60 percent Pinot Bianco, 30 percent Chardonnay and 10 percent Sauvignon Blanc, it's hard to identify by the expected character of any of those varieties, yet it's a delicious mix of tropical fruit and heady floral aromas, with rich texture shaped by food-friendly acidity. Well worth the 19 bucks, as long as you don't mind grape varieties touching in your glass. What do you think? Are you a mixer or a separator at the dinner table, and does this preference carry over to your wine glass? Click here to tell us your preference and discuss this topic on the WineLovers Discussion Group. FOOD MATCH: Its floral, complex flavors and tart acidity make it a match for hearty, spicy fare, with a tilt toward poultry, pork or veal. It was fine with a quick pilaf with local free-range chicken with Vidalia onion, garlic, saffron and basmati rice. VALUE: I'm not excited about the continued price inflation of Italian whites, but in fairness, it's priced fairly against quality competition in the upper teens. WEB LINKS: The winery Website is available in Italian, German and English. Click your choice of Benvenuti," "Willkommen" or "Welcome" for your preferred language. Here is the winery's fact sheet on the Terlaner. Check prices and find vendors for Terlano Terlaner on Wine-Searcher.com.